There is no "Republican," no "Democrat," on the Fourth of July — all are Americans. All feel that their country is greater than party. 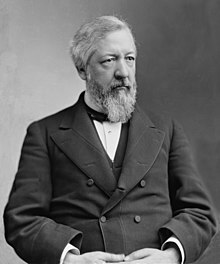 James Gillespie Blaine (31 January 1830 – 27 January 1893) was a U.S. Representative, Speaker of the United States House of Representatives, U.S. Senator from Maine, two-time United States Secretary of State, and champion of the Half-Breeds. He was a dominant Republican leader of the post-Civil War period, obtaining the 1884 Republican nomination, but losing to Democrat Grover Cleveland. The United States is the only country with a known birthday. All the rest began, they know not when, and grew into power, they know not how. If there had been no Independence Day, England and America combined would not be so great as each actually is. There is no "Republican," no "Democrat," on the Fourth of July — all are Americans. All feel that their country is greater than party. This page was last edited on 29 August 2018, at 11:11.